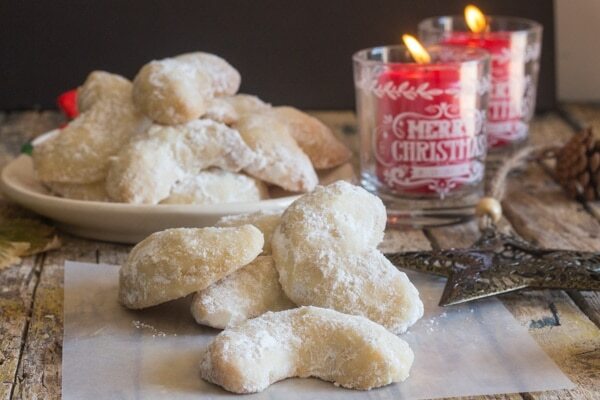 Almond Crescent Cookies, a must make melt in your mouth, shortbread type Christmas Cookie. Fast, easy and the perfect addition to your Cookie Tray. I woke up this morning and I thought “5 1/2 weeks until Christmas”! So what does that mean? Besides decorating and gift buying. Unless you are like me and Last Minute works just fine, thank you very much! Except of course for cookie baking. I like to get my cookies made and in the freezer. 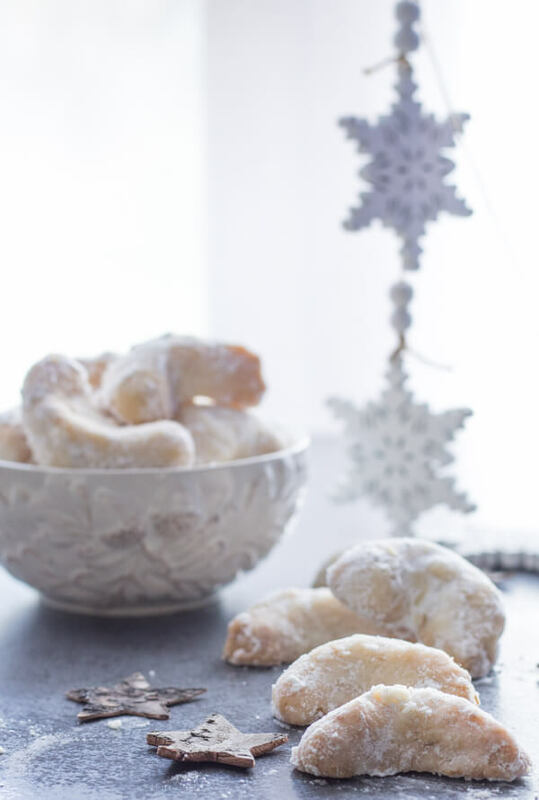 And yes these Almond Crescent Cookies which she always called Viennese Crescents, are another Delicious Christmas Cookie Recipe thanks to my Mom. Every year without fail she would bake up Whipped Shortbread (sometimes she would add chopped nuts instead of chocolate chips), Classic Shortbread, Hello Dollies (or also known as 7 layer bars). And my own personal favourite, Coconut Jam Squares, these are an amazing bar cookie. I could eat a whole pan of those ! And of course these yummy melt in your mouth Crescent Cookies. I can remember coming home from school and there she would be baking, boxing and freezing. Of course I would have to have a taste before they were boxed. And to tell the truth frozen cookies tasted pretty good too! 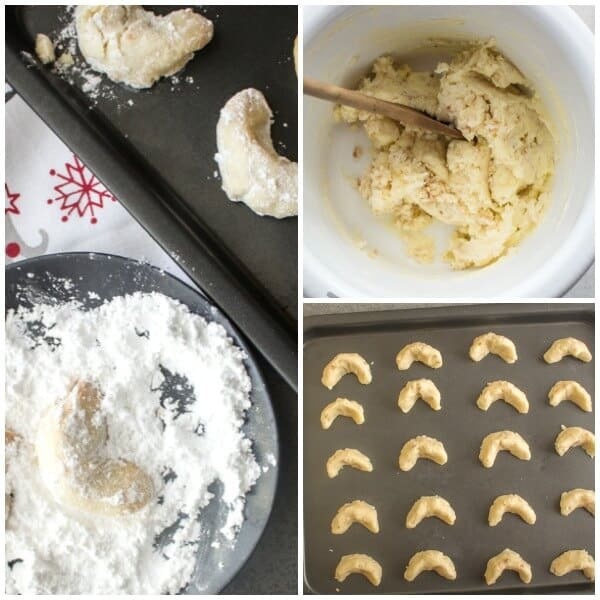 These Almond Crescent Cookies are really easy and quick to make, no refrigerating the dough. Just whip the butter until fluffy beat in the sugar. Add the rest of the ingredients, bring it all together to form a dough. Shape into the crescent form and bake for about 15 minutes. Then when they are still warm roll in some icing/powdered sugar. If you can keep from eating them all, you can also freeze them until Christmas. They make a delicious Cookie gift idea. The Italians love them. And if you can’t wait for Christmas that’s ok too! I use a Hand Mixer to beat the butter and sugar. And these non stick Baking Pans are perfect. And these cute Gift Boxes are great for gifting homemade baked goods. 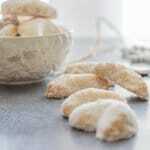 If you have never tried Almond Viennese Cookies then I am telling you these are a must try. Happy Baking. Enjoy! ***Remember do not ground the nuts to a powder, they should be chopped into very small bits. Place the nuts in a plastic bag and smash them with a rolling pin, this works well. ***Please note the amount of FLOUR, 2 1/2 cups worked for me but it seems to be too much for most. So please start with 2 – 2 1/4 cups and if the dough seems too wet add a tablespoon (up to two) at a time if needed. 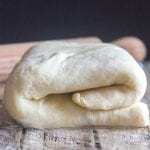 If you do find the dough dry work some soft butter into the dough to soften it up. Sorry for any inconvenience. This is an amazing cookie recipe, that I really want to work for everyone. Merry Christmas and Happy Holidays to all. Almond Crescent Cookies, almond, pecan or walnut these melt in your mouth Christmas Cookie Recipe are a must make. Delicious. In a large bowl beat butter until fluffy, add sugar and beat again until fluffy. Scrape down the sides of the bowl and add nuts, flour ** (add 2 cups to start and 1 tablespoon at a time (up to 8 tablespoons if needed See Note Above!) ) and salt. Bring dough together with your fingers. Break off small pieces and form into a crescent shape. Place on ungreased cookie sheets and bake for approximately 15 minutes . While cookies are still warm roll in icing/powdered sugar. Can be frozen. Enjoy! These cookies are awesome. I make them all year, not just as Christmas. I add 1/4 teaspoon almond flavouring which just intensifies the wonderful flavour. Hi Joanne, thanks I agree, anytime of the year is good for me too! Good idea with the almond flavouring. Have a wonderful Sunday. Have made these 2 yrs in a row for Christmas. Both times they flatten into a vague shape. We live in northwestern USA. Does climate make a difference? We’re about ready to rename them because they’re good but certainly not crescents. Any ideas? 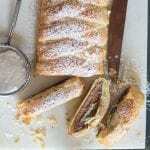 I just made these,I added some cinnamon,they are scrumptious! Hi Francesca, thanks so much, good idea with the addition of cinnamon. Have a great week. Easy to make and oh so delicious!! Hi Diane, thanks so glad you enjoy them. Have a great weekend. Hi Diane, so glad you enjoyed it. Have a great weekend. What brand of butter is best and is unsalted? Hi Eliza, thanks hope you enjoy them. Happy New Year. Hi Judy, thanks so glad you enjoyed them. They are one of our favourites. Have a great week. These were amazing! Just like I remembered from childhood! What do you put them in to freeze them – hard container? Freezer bags? Hi Sherri, your welcome so glad you enjoyed them. I usually freeze them in a hard container the has a tight fitting lid, although I have frozen them in freezer bags, so both work. 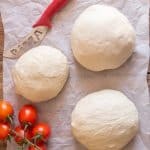 Can the dough be frozen ? Hi Valerie, yes you can I did a small post on freezing https://anitalianinmykitchen.com/my-moms-best-christmas-cookies-and-bars/freezing-cookies-and-bars/ . Hope it is helpful. May blanched almonds be used instead of raw? Could I replace the flour with almond flour? I loved these cookies! But wanted to make them for a friend who’s on a keto diet. Hi Lillian, I have never made it with anything other than all purpose flour, you could try it and see (maybe half the recipe to try it out) Hope that helps. Have a great week. Can a sugar substitute be used ? I’d just like to say, I have no suggestions or questions about quantities. Your recipe is fantastic and I’m honourd you shared it and would never presume to change your recipe. Hi Debbie, thanks so much, so glad you like it. Hi Ang, you could use less sugar, but cut back a bit on the flour (add extra if needed), I don’t know about the icing sugar because this recipe has always been made with granulated sugar. Hope that helps. Would self rising still work? Hi Jessica, I don’t think so you need a flour with a high protein percentage, or they will go flat. Hope that helps. 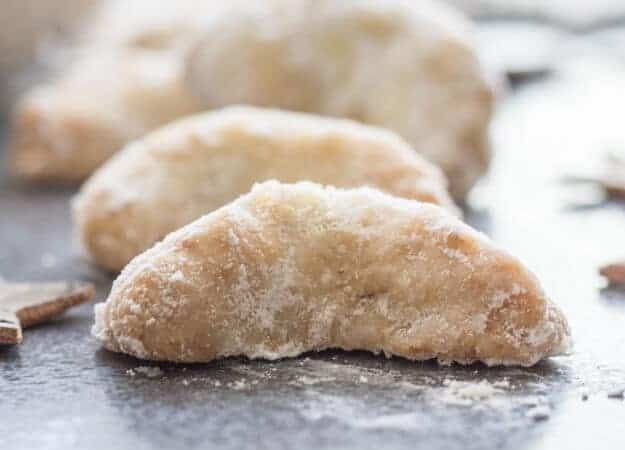 My mom made Crescent Cookies every year at Christmas time. course the extra flavor with the vanilla. I make these anytime of the year. I get asked to make them by friends all the time. I no longer shape them into crescents, I either roll the dough into small balls. I make Jerky with a “Jerky Gun” it has a small attachment for making sticks. I sometimes use this by making a straight line of dough the length of my cookie sheet then cut them in sections before baking them. Hi Laura, great idea and I think they are great anytime of the year too! It may be obvious to others but I was wondering, is it 3/4 c of almonds then chop or 3/4c of chopped almonds? I’ve made these for 45 years Evil Grandma Nancy’s recipe lol We use 2 cups flour but no other difference..I’m making some right now with no nuts as I have none and was dying for cookie !! Every Christams we had these and i make them in honor of the elders who are all gone now…I once found my mother with her face on the plate licking crumbs ..lol GOD she love3wd these cookies!! Haha your Mom that would be me too and how nice in honour of the elders. I’m sure these are good too even without nuts. Have a great week. This is the exact recipe my grandmother gave me over 50 years ago. She taught me to roll the dough out on the counter to about 1/4 to 1/2 inch thick, then using the drinking edge of a juice glass cut the cookies into a crescent moon shape. These cookies do not change shape or size so you can place them fairly close together on the pan. Would not be Christmas without them. Hi Suzanne, what a great idea with the juice glass! They are one of my favourites and you are right, Christmas without Crescents just isn’t right. Have a great week. Our family recipe has been lost, so I’ve been trying recipes for thec last few years hoping to find “the one.” This is it! They baked perfectly, melted in our mouths, very delicate and not overly sweet. Very nice, thank you! 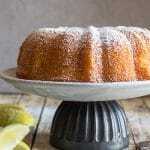 Hi Carron Ann, so glad you found “the one” this recipe is so old, they were always one of my favourites. Have a great week. I made these almond cookies for Christmas and they were amazing. I want to make more for the New Year. Thank you for sharing this simple and tastey recipe. Hi Nina, thanks, so glad you enjoyed them and Happy New Year. My family loved these! Even my picky kid who doesn’t like nuts. I added 1/2 teaspoon of vanilla and only need 1 1/4 cup of flour. I had no trouble with the dough it was perfect. 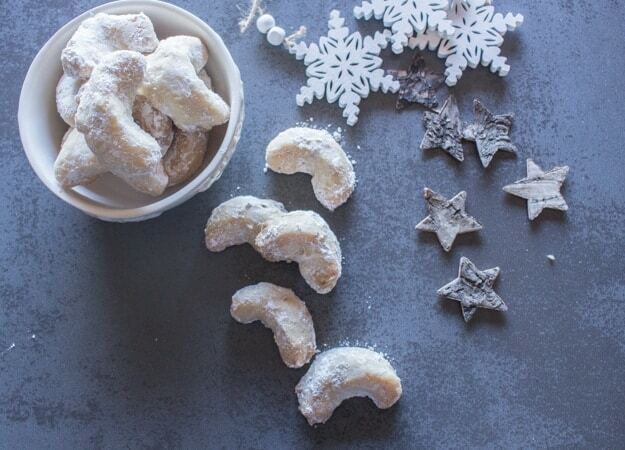 These cookies are very easy to make and we will be making them every Christmas. Hi Lori, so glad you enjoyed them and your picky kid. I have one of those and she loved them too. Merry Christmas. Can I substitute butter for margarine or do half butter half margarine? We love these! Super simple and easy to make! Thank you so much for sharing this recipe. My husband said I made the first batch a bit too big. Even though we can’t stop eating them! Lol I think I’ll make smaller sized cookies next time. Maybe closer to one or two bites then three or four bite sized cookies. Thanks again Awesome recipie! HI Newanna, so glad to hear you enjoyed them. I make them into smaller cookies also. Have a wonderful Christmas. Hi Rosemary, I tried this recipe and used all three kinds of nuts that I ground up together. That may have been my mistake. Anyway they all flattened out and got really crumbly after baking at 350 for 13 minutes. Do you have any thoughts as to how to prevent this in the future? Hi Ashlin, the only thing I can think of is you ground the nuts too fine, they should be finely chopped not ground to a powder (because you need the moisture from the nuts). If you do make them again, maybe cut back on the flour to start, add 2 1/4 cups and if more is needed then add a tablespoon at a time (up to 4 tablespoons). Let me know. Hi. The dough is so crumbly and won’t come together well and when I try to form a crescent it just falls apart. Any remedies for this? My dough is very crumbly also. How were you able to form crescents? Every time I get a bit of dough together, it just falls apart as soon as I try to roll it in my palms to form a crescent. Help! I’m on the verge of throwing it all away. Hi Lisa, I am sorry for this but all I can think is you ground the nuts too finely (they should be chopped very small). Let me know. Hi Lisa, try adding a little more butter and see if that helps. I have a similar recipe that says to add a few drops of water to help bind the dough and it works well or extra butter should work too. I am looking forward to making this recipe and will add almond extract just because I love the flavour. I also think orange extract with fresh orange zest would be a nice addition. My son in law is Italian and his mother makes these delicious cookies every Christmas. Thanks Colleen, hope you enjoy them. Have a wonderful Christmas. Are the cookies just rolled in powdered sugar when they are still warm? I am confused by the icing/sugar? Hi Joc, yes the cookies are rolled in the icing sugar when they are still warm (not hot). Hope that helps. Hi Julie, you probably could but use mini chips and cut down to 1/2 cup. Let me know how it turns out. I was afraid I did something wrong because the dough was so crumbly looking but they came together beautifully. I cant stop eating these! Thanks for a great recipe. Hi Valerie, thanks so glad you like them and yes they are addicting. Have a great day. are the cookie sheets greased or not?Also do the cool on cookie sheets,or do you remove immediately? Hi Geri, I used a non stick cookie sheet, with all the butter in the cookies I really don’t think it needs to be greased. My Mom didn’t write that on the recipe so I assumed un greased. Can you make them with either almonds, walnuts, or pecans or do you use all three in the recipe? I am new to baking so I want to make sure I understand the ingredient correctly! Thanks! Hi Rosemary, I added 1 tsp. Vanilla and 1tsp. Almond extract to inhance the flavor of the ground almonds. Results are wonderful! Hi Cynthia, sounds like a good idea, glad you liked them. Have a great week. When I was a kid there was a lady in my church that made these for every single event. They were my absolute favorite and she would often make me my very own batch to take home. She has since passed on so I’m very happy to find this recipe. I’ll probably call them Alma’s Cookies in her honor! Thanks for the recipe! Hi Lisa, so glad to hear that Lisa, I remember those days, I had the best fudge I have ever tasted in my life that a lady made at a church bazaar and I have yet to taste a fudge like it. Have a great Sunday. Hi Laura, you need high protein flour, one that is at least 12% and be sure to use ground almonds not almond flour, and maybe try with regular sugar and not powdered. Hope that helps, let me know. I’m wondering what the shelf life of these cookies is if not freezing and giving as gifts. Thanks! Hi Maya, the shelf life of these cookies and all soft homemade cookies are 2-3 days. What I do is freeze them and then defrost them when I am gifting them and they always get eaten in less than a day (so what I am told) 🙂 Hope that helps. Your welcome, have a wonderful Sunday! When you say 3/4 c sugar in the recipe are you meaning regular sugar or icing sugar? Hi Jill, I used regular sugar, the warm cookies are rolled in icing sugar. Hope that helps. 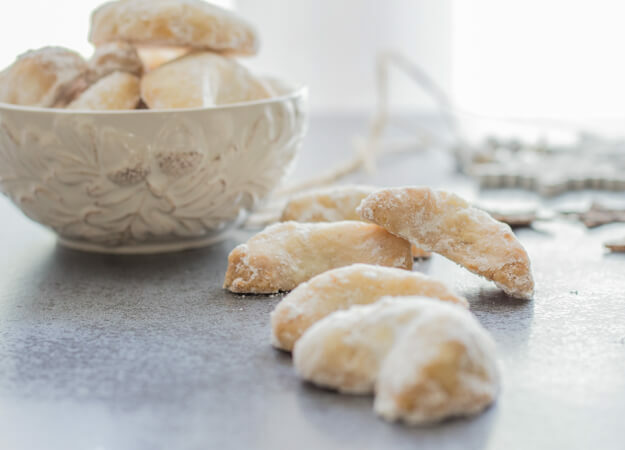 I recently had a crescent shaped Italian cookie and these seem to be the nearest thing to them and easy for me to make. I am sure they were made with icing sugar and cornflour instead of normal sugar and flour. Wonder about mixing half and half to try? Hi Peter, well you could try making it half and half and see how it comes out. I have never had one made like that, but I would love to know how they turn out. Have a wonderful Sunday. Hi Donna, there is no icing, you just dip the warm cookies in icing/powdered sugar. Hope that helps, let me know. Gonna try this for this christmas. Can I use almond flour instead of regular APF? Hi Srividhya well you could try it, maybe do half the recipe to see how they are. Let me know how it works out. These were my favorite cookies growing up. My mom made them every Christmas, but I never got the recipe. Thanks for sharing! Hi Lynda, I love these too, and your welcome. Does it matter if you use salted or unsalted butter? These look delicious, can’t wait to try them!! Hi Donna, I always use salted since it is very difficult to find unsalted in Italy. If you use unsalted you might want to increase the salt by a bit, maybe add a pinch extra. Hope that helps. Hi Kristy I think my Mom did too, but no unsalted butter in Italy. So I have to use salted. I just had the pleasure of eating some of these and they are delicious and delicate. When you freeze these do you have to bake them first and coating them would you do that after they are thawed? Thank You for sharing your recipe. The Italian lady that made these used almonds but said her favorite are made with crushed hazelnuts. I love almonds myself. Use the crushed almond flour in some of my cookies for son who must have Gluten free recipes. Almond flour I use is just crushed almonds ground very fine. Don’t know if it would work for all recipes but I made brownies and although they don’t rise much the taste was richer. Happy Baking. Hi Bea, thanks so much, I coat them first and then freeze (because they should be coated when still warm). If you use almond flour let me know how it works out. Have a wonderful week. These remind me of snowballs! Looks like Christmas and the holiday season to me! Thanks Beth, and yes the best time of the year! Hi Cesia, I always use room temperature butter because it is easier to whip. Let me know how you like them.